You get Ray Davies, Elvis Costello and the wonderful Nick Lowe for nothing in a lovely park in central London in great weather so if you’re not doing anything come on down. I’m on around three on a side stage. Call me Sideshow Bob. Call me cheap, desperate, call me what you will. It’s free. You were hot, hot, hot Justin! Thanks for having your picture taken with me…made my day! Was pretty great already, getting to see some amazing music for free! See you at The Union Chapel! Actually the more I look at this photo can’t help but think of Mick Jagger with those lips of yours. Now that Elton’s not there they should get The Rolling Stones as the replacement, can’t believe they played Glastonbury for the first time a few weeks ago. Well done Les! You lucky bugger. Hey cant you get Iain down, reform for one day only as Del Amitri to fill a slot on the main stage and move the others up one. Would be a giggle? Have a great time Les!!! You must have read my mind and took the words right out of my mouth. I’ve known all along you are a hot Scotsman. 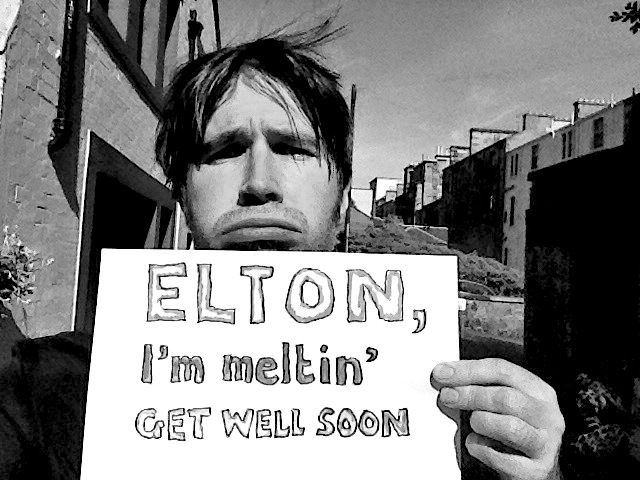 I’ve just heard that Elton had to pull out due to appendicitis. Ouch! 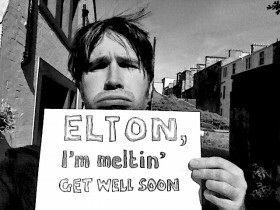 I’m with you Justin, get well soon Elton.